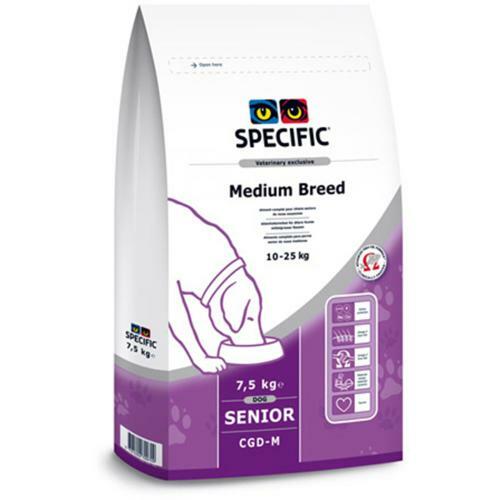 Specific CGD-M Senior Medium Breed Dog Food is a delicious kibble that has the right mix nutrients like Omega-3 fatty acids, antioxidants and L carnitine to help your dog stay active and vibrant well into adulthood. Plus it is high in fibre to help your dog’s digestion! Rich in Omega-3 from fish for healthy coat skin and joint. Helps to maintain the ideal bodyweight. With lower calories and higher fibre this is a less energy dense food. This means they can eat their usual amount, so not feel hungry, whilst controlling weight. It also contains L carnitine – a fat burning amino acid. The use of highly digestible proteins such as fish allows them to digest the food even with the less efficient digestive systems of older dogs. High fibre and added MOS supporting healthy digestion. Reduced protein, phosphorous and sodium to lower workload on the kidneys..
Added beta glucans from yeast to support the immune system. Added Taurine supports the heart muscle function. Wheat, maize protein, fish meal, fish oil, beet pulp, hydrolysed poultry protein, fermented whey protein, pork fat, minerals, eggs, vitamins and trace elements, yeast (source of beta-1,3/1,6-glucans and mannan-oligosaccharides), lysine, taurine, methionine, threonine, tryptophan, L-carnitine. Antioxidants: EC approved additives: BHA, BHT, propyl gallate. It contains no artificial colours or flavourings.